Colin Montgomerie has admitted that the one shot in his career he’d like to hit again is the sloppy one that cost him the US Open in 2006. The eight-time European No 1 said in a “Quick Nine” interview with golfwrx.com that his “mulligan” would be the approach at the last in the final round at Winged Foot. Leading the season’s second major, Montgomerie missed the green with a 7-iron as he eventually lost out to Australian Geoff Ogilvy, squandering his best chance to win a regular major. “I was in the fairway and completely messed up a 7-iron,” he recalled. “I eventually took double bogey where bogey was enough for a play-off. “And it should have been easy, with me as a fader of the ball and the pin on the right side of the green it should have been easy to just aim at the middle of the green and let it go, and I made a complete [mouths an expletive] of it. A waterlogged course forced this morning’s restart in the Joburg Open to be delayed, leaving a Scottish trio facing a marathon day. It had been hoped that play could get underway at 6.45am at Royal Johannesburg & Kensington after officials called a halt to proceedings at 2.35pm on Thursday. However, the condition of the course forced that to be put back to 9.30am local time, with the second round scheduled to start at 10.15am. David Drysdale, Scott Jamieson and David Law had all still to complete their opening rounds, the latter having only played six holes before the suspension. Marc Warren, who shot a four-under 68, had finished by then, as had amateur Connor Syme (71), Duncan Stewart (72) and Scott Henry (73). American Paul Peterson held the clubhouse lead overnight following a nine-under-par 62 on the West Course. Russell Knox finished birdie-birdie to salvage a three-over-par 73 in the first round of the Honda Classic, the event he’s twice come close to winning, at Palm Beach Gardens in Florida. But the effort left the Scottish No 1 sitting joint-96th and needing a low second round today to be around for the weekend at PGA National, where he finished second in 2014 then third the following year. American duo Cody Gribble and Wesley Bryan share the lead on 64, a shot ahead of Germany’s Martin Kaymer and India’s Anirban Lahiri. Play was suspended during this morning’s second round of the Honda LPGA Thailand due to “inclement weather” in Chonburi. Two of the overnight leaders, including home player and world No 2 Ariya Jutanugarn, were still sitting at the top of the leaderboard on six-under as play was halted. Scottish No 1 Catriona Matthew ended the first day sitting last of the 70 players after starting with a nightmare 12-over-par 84. On an uncharacteristic off day, Matthew slumped to her worst score since signing for a second-round 83 as she missed the cut in the 2014 Ricoh Women’s British Open at Turnberry. Her worst previous score in a regular LPGA event was an 80 in the second round of the LPGA Keb Hana Bank Championship in October 2013. Liam Johnston lamented his putter turning cold as he came up agonisingly short in his bid to become the fifth Scot in just seven years to win the Sanlam South African Amateur Championship. The Dumfries & County player bowed out in the quarter-finals at Humewood but only after digging deep to take his tie against Caylum Boon into extra holes before succumbing to the home hope at the 21st. “I struck it the best I have all week this morning in the wind but, unfortunately, my putter went a bit cold and in matchplay that’s the key component,” said Johnston. Boon trailed early on in today’s all-South African final - the first since 2014 - to fellow Southern Cape player Christo Lamprecht. Clydeway Golf’s Graham Fox jumped to joint-12th on the back of a second-round 70 in the PGAs of Europe Messinia Pro-Am in Greece. But, despite a seven-shot improvement from day one, he still trailed the leader, Federico Elli, by 14 shots heading into the final circuit. 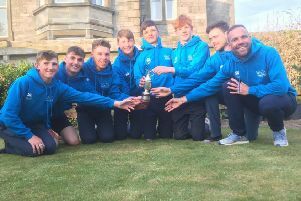 Keir McNicoll, who is heading back to his roots at Carnoustie to take up a PGA post, finished four shots clear of the field in an East Alliance event at a windswept Craigielaw. He shot a two-over-par 73, a fine effort in the tricky conditions, with Steven Dunsmore from Falkirk Tryst his closest challenger in a 75-man field. Newmachar’s John Duff recorded his ninth win of the North-East Alliance campaign as he shared the spoils with Portlethen amateur Gary Esson in the circuit’s latest event at Montrose Links. The pair carded match one-over-par 70s.